Well, almost ;) I figure we’re close enough that I can both say that and share this and it will all be good. 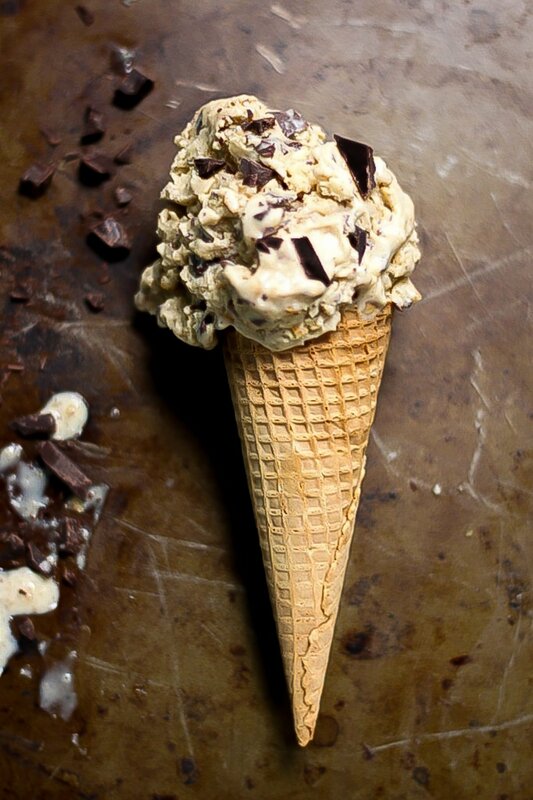 And by this, I mean, Guinness Double Chocolate Chunk Ice Cream, of course! It’s just too good to keep to myself. Just-too-good! 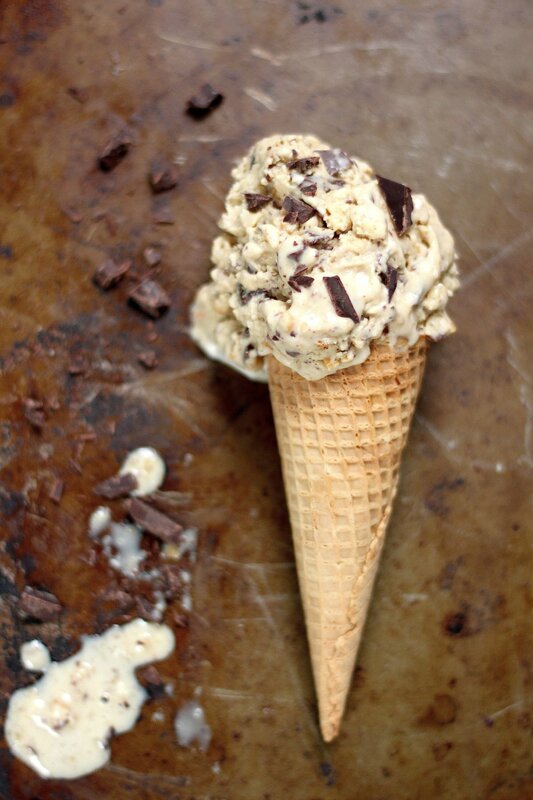 The base of this ice cream is a creamy, boozy, Guinness spiked dream! It’s SUPER creamy thanks to a ton of egg yolks, cream, milk, and (of course!) Guinness. Oh. And when I say a ton of egg yolks, I mean it! There are 14 in this recipe. Yes. 14!!! But please trust me that you don’t want to skip any of them. I tested this recipe with less and it was just not creamy enough. So yeah… 14 – it’s the golden number! I also swirled in shaved white and dark chocolate chunks. I made some super thin and melt-in-your-mouth papery, while leaving others chunky and completely un-subtle – the combo just works! In a large sauce combine guinness, cream, and milk. Bring mixture to JUST a boil, then remove from heat. In a large bowl beat together egg yolks and brown sugar until light and fluffy. 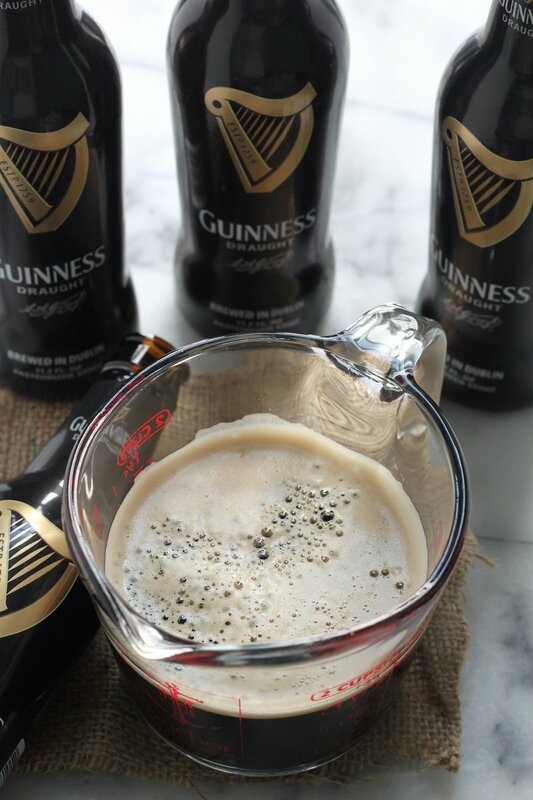 Add a small amount of the hot guinness mixture to the eggs and whisk it quickly together (to temper the eggs), then carefully pour the remaining guinness mixture into the egg mixture, whisking to incorporate. Pour the mixture back into the saucepan and heat over medium-low - whisking constantly - until the mixtures thickens enough to coat the back of a spoon. Do NOT let the mixture come to a boil or it will curdle. Once thickened remove pan from heat, and stir in vanilla. Pour the custard into a large heat proof bowl, cover with saran wrap touching down to the custard (to prevent skin from forming), and place bowl in the fridge for at least 3 hours. When ready, pour custard in your ice cream maker and freeze according to your machines instructions. Once it's finished churning, stir in chocolate chunks. Transfer ice cream to an airtight container and freeze for at least 6 hours. omg yummmmmm. my friend hubby is obsessed with guiness. must show this to her. xO! 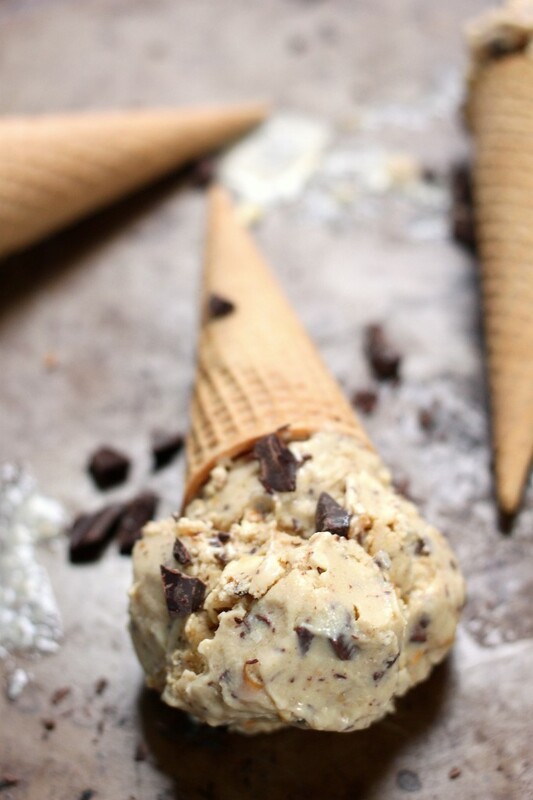 I am totally obsessed with the white and dark chocolate combo with the Guinness–so dreamy, and you can just see how rich and creamy the ice cream is! You are amazing!!! Two incredible recipes in one day!! Best use EVER of beer 🙂 love it! I am speechless.. this ice cream is divine! Love, love, love this! Wow, this is so creative. Best St. Paddy’s recipe yet! Pinned. 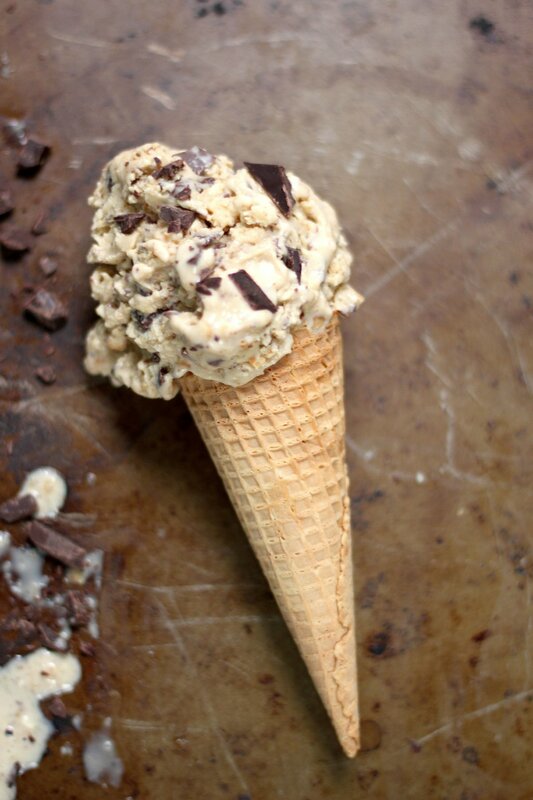 This looks like the most incredibly decadent ice cream — especially with all those chocolate chunks. Wow — 14 egg yolks! I can almost taste the creaminess just by looking at the screen. I normally don’t love St Paddy’s day, but this.. I can get behind! Wow – 14 yolks? It sounds sinfully creamy and amazing! this ice cream looks incredible! I love your photos! WHOA. 14 egg yolks??! FOURTEEN?! This ice cream must be craaaazy rich—which is like…amazing!!! Ok there is no way I can pass this up!!! So so yummy and fantastic idea. 14 eggs? I’m game!! 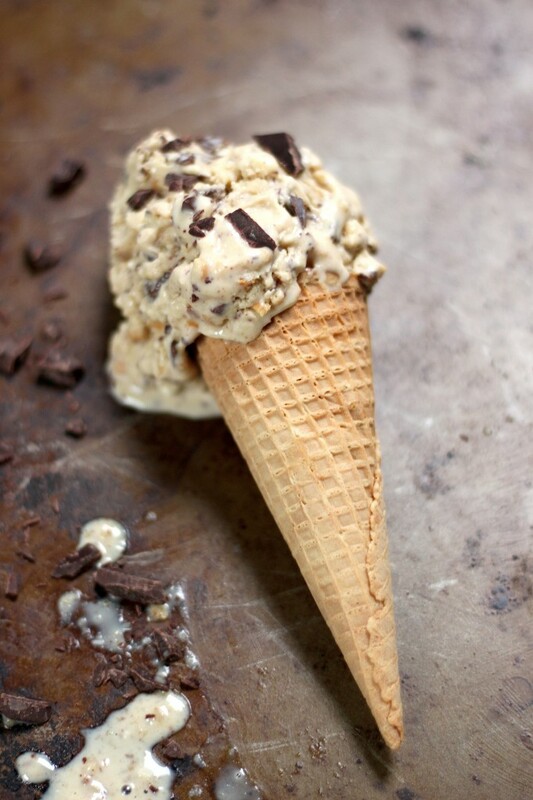 Love those chocolate chunks, what an incredible ice cream!